e have been documenting for 20 years the concerts at the UNESCO World Heritage Maulbronn Monastery. The concerts supply the ideal conditions for our aspirations. It is, above all, the atmosphere of the romantic, candle-lit arches, the magic of the monastery in its unadulterated sublime presence and tranquillity that impresses itself upon the performers and audience of these concerts. 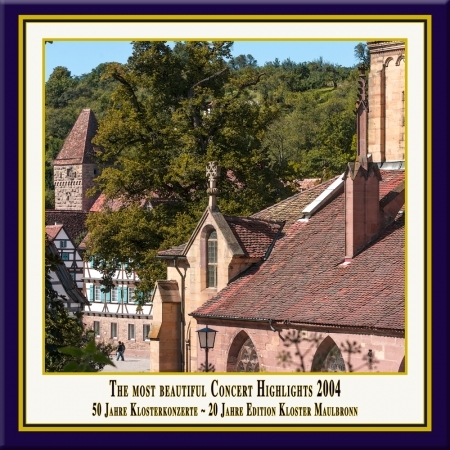 Renowned soloists and ensembles from the international arena repeatedly welcome the opportunity to appear here - enjoying the unparalleled acoustic and architectural beauty of this World Heritage Site, providing exquisite performances of secular and sacred music, documented by us in our Maulbronn Monastery Edition. The oratorio, Belshazzar, devotes itself to the story of the Babylonian king, Belshazzar, as presented in the biblical story from the book of Daniel. Belshazzar commits sacrilege against the God of the Israelites, upon which a ghostly hand inscribes the mysterious text, the Menetekel, upon the wall of the court, predicting the downfall of the kingdom and the death of Belshazzar at the hands of the Persians. The prophecy is fulfilled that very same night. There are three versions of Belshazzar, dated 1745, 1751 and 1758. Handel composed the first between 23rd August and 23rd October, 1744. The exact dates are known from the correspondence Handel had with his librettist, Charles Jennens. Jennens had already penned the libretti to Saul and the Messiah. He was an enlightened theologian who didn't shy away from embellishing the biblical story to enhance the libretto's dramatic development. The debut performance took place on 27th March 1745 in the King's Theatre, Haymarket in London. But the work attracted few listeners, with even fewer being enthusiastic. A possible reason for this failure was the political message, from Handel unintended but nevertheless inferable, contained in the libretto. It could be seen as a manifesto against the ruling king of the time, George II, who, as a member of the House of Hanover, was not seen as the rightful monarch by many of the British. So it was that the conquering of the throne by Cyrus was seen as an allegory of a similar conquest in England by a member of the House of Stewart. Belshazzar was discontinued after only three performances and only years later, in 1751, after revisions from Handel, was it resumed. In addition to minor improvements, the changes included new arias, whereby others were cut and the role of Cyrus was song by a countertenor instead of a mezzo-soprano. It was far more successful than the original, and it is this second version (slightly shortened) that was used for this recording. It starts with the second scene of the première. Charles Jennens created an unbelievably dramatic libretto. He embroidered the biblical story of the Babylonian king, Balshazzar, with historical sources he found in Heredotus and Xenophon. In the oratorio, for example, the key figure of Nitocris is taken from Herodotus's histories apodexis. The oratorio has, even for Handel, extraordinary colour and vitality. The responsibility for the high drama of the piece rests mostly with the choir, which musically represents the three peoples. Babylon, the capital of Assyria, in the year 538 BC, is the scene of the action. The Euphrates flows through the city. It was diverted during the building of the city walls and a lake on the west side of the city was formed. The armies of Media and Persia, under the leadership of King Cyrus, are encamped before the walls. The first act starts before the gates of Babylon. From the walls, the Babylonians mock Cyrus and his fatuous plans to take the city. Gobrias, a Babylonian who has defected to Cyrus after his son was murdered by Balshazzar, confirms the sturdiness of the city's fortifications. Cyrus consoles him and relates his dream where he has seen the Euphrates dried up. He then devises a plan whereby the river would be diverted to the lake outside the walls, allowing them to penetrate the city using the waterless riverbed. Gobrias supports the idea to venture the plan on the day of the feast to Sesach, when the Babylonians pay homage to their god of wine, Sesach, and it is their religious duty to become intoxicated. Cyrus rouses his army and prays to God for support. The ensuing chorale takes up this plea to God from the Persians. In Babylon, the prophet Daniel predicts, for the imprisoned people of the Jews, the impending downfall of the city and proclaims Cyrus their God-sent liberator. The Jewish people sing a joyful chorale about their imminent deliverance. The chorale's first solemn, homophonic section expresses their hope of rescue. In the fourth scene, Belshazzar opens the festival in honour of Sesach. The people revel and imbibe excessively. Nitocris pleads with her son to put a stop to the celebrations, but he orders the sacred chalice of the Jews to be brought from the temple to be used as a wine goblet. Nitocris and the Jews warn him of the consequences of this sacrilege. The Jewish people react with the announcement that Belshazzar will shortly feel the wrath of God for his actions. In this three-sectioned chorale, the emotions develop by slow degrees: at first, sadness and hurt, then, in the second and third sections respectively, the suppressed and finally the released anger can be perceived. Especially moving is the demand for remorse that the Jewish people express. It goes singly through all the voices, builds up and finally flows into a homophonic sounding realisation that the waiting apparently will be in vain. The chromatically descending line "and every step he takes on his devoted head precipitates the thunder down" symbolises this hope gradually being transformed into anger.
" with the soprano theme (coloratura) reflecting the flowing of the waters and the joyful excitement radiating out amongst the Persians as they watch the spectacle. This further prompts them to partake in a bizarre role-play, in which they contrive a dialogue between the incensed Babylonians (female choir) and the emboldened Persians (male choir). Then Cyrus gives the order to cross the riverbed and capture the city. The Persians intone a belligerent chorale. The feasting of the Babylonians is at its highpoint. Belshazzar is arrogantly blaspheming Jehova and, just as he is about to take the chalice to his mouth, there occurs what the Jews had warned him would happen. A ghostly hand inscribes on the wall the incomprehensible words "mene, mene, tekel, upharsin". Here, Handel realizes a musical treatment that is possibly is not close to any other operatic convention. The violins ascend unaccompanied in a chromatic line adagio e staccato, ma piano. Belshazzar is struck dumb with horror, solely able to utter an appalled sigh. The people of Babylon cry for help while Belshazzar still points fearfully at the mysterious script. Nobody can decipher the writings, and, at the suggestion of Nitocris, the prophet Daniel is summoned. He translates, from Handel composed as a suspenseful recitative accompagnato, the following: mene, it is the will of the God you dishonoured that the days of your reign be numbered; tekel, you have been weighed in the balances and found wanting; upharsin, your kingdom will be divided and be given to the Medes and Persians. Nitocris beseeches Belshazzar to plead with Jehova for forgiveness, but he does not allow himself to be swayed, even now. Cyrus and Gobrias infiltrate the city and lay the foundation for the dethroning of Belshazzar. The third act opens with Nitocris in her chambers receiving news of the conquest of the city. The Jews are joyfully celebrating and thank Jehova for his mercy. Convinced of his strength, the brazen Belshazzar confronts the invaders. He falls in battle, the orchestra executing a military march. Nitocris submits to the new ruler, Cyrus, who promises the Babylonians freedom also. He grants this to Nitocris as well, and even entreats her to accept him as son in Balshazzars stead. Daniel predicts for Cyrus that he will become the deliverer of the people of Israel and will rebuild the city and temple of Jerusalem. This, Cyrus commends to do. This live recording of Handels Belshazzar is part of a cycle of oratorios and masses, performed in the basilica of Maulbronn Abbey under the direction of Jürgen Budday. The series combines authentically performed oratorios and masses with the optimal acoustics and atmosphere of this unique monastic church. This ideal location demands the transparency of playing and the interpretive unveiling of the rhetoric intimations of the composition, which is especially aided by the historically informed performance. The music is exclusively performed on reconstructed historical instruments, which are tuned to the pitch customary in the composer's lifetimes (this performance is tuned in a' = 415 Hz). To meditate, ponder, and reflect: verbs such as these are becoming increasingly significant in a fast-moving society such as ours. One usually associates with 'meditation' a kind of celestial relaxation music with an accordingly notional incitation to self-discovery. But what happens when a great orchestral work by Haydn, created to animate reflection on "The Seven Last Words of Our Saviour on the Cross", is heard in an authentic setting such as the 'Maulbronn Monastery'? 'Meditation' then takes on quite another meaning, one entirely in keeping with the purpose of the composition and its original occasion. For in 1785, Joseph Haydn was commissioned by a canon in Cadiz to write a kind of sacred instrumental music for Holy Week, a work illustrating the "seven last words of the Lord". The composer agreed and proceeded to compose "Sieben Sonaten mit einer Einleitung und am Schluß ein Erdbeben" (Seven Sonatas with an Introduction and an Earthquake at the End) for large orchestra, which was then performed, probably on Good Friday in 1786, in the subterranean Church of Santa Cueva. Some 15 years later, Haydn described how the performance took place: "In those days it was the custom during Lent each year to perform an oratorio in the main church in Cadiz. The following preparations contributed in no small way to enhancing its effect: The walls, windows and pillars of the church were draped in black, with but a single lamp hanging in the middle to shed light into the darkness. At noon all the doors were shut. Then the music began. After a suitable prelude, the bishop mounted the pulpit, pronounced one of the seven Words and made some appropriate observations. The bishop mounted and left the pulpit a second time, a third time, and so on, and at the end of each oration the orchestra would start up again. My composition had to fit this description." Haydn resorted to a trick commonly employed in the 18th century: an instrumental composition would be written to follow the thread of an imagined text, dialogue, perhaps even an entire drama, whose contents the music would "speak". Music thus became a "narrative" art, the contents of which were accordingly quite concrete. The seven heads in the title illustration of the longplay album symbolise the engagement of the human mind with the sublime words and the present ongoing decay of those words. The oratorio Moses holds special meaning in composer Max Bruch's body of work. He originally viewed it presumptuous to continue in the tradition of the major works by Händel and Mendelssohn. In a letter to the music writer Hermann Deiters he wrote in 1873: "Biblical subject matter is foreign to my nature; the old masters have made such formidable contributions in this area so that it is only possible for us to make independent and new accomplishments in conjunction with other subjects. It is no coincidence that every oratorio since Mendelssohn has been a failure." Whatever it was that ultimately triggered Bruch's change of mind remains a mystery, but in 1893, he wrote to the Bach researcher Philipp Spitta, the brother of his future librettist Ludwig: "You are the first, and will, for the time being, be the only person I trust to disclose a plan that so vividly occupies me. Do you wish to read intently the composition, the poetic foundation of a large-scale oratorical work: Moses at Sinai' (or Israel in the Desert)... long have I sought and groped, momentarily pondering this, and then that. Because I am bound and determined to not further enhance the drama of the worldly dramatic cantata... which is why I have returned to the enclosed, truly oratorical plan, with which I was already seriously occupied in 1889, and again in 1890. It begins where Händel's Israel in Egypt' ended. As far as I can conclude, no other musician of relevance has ever addressed this part of Moses' history..." Conducted by Bruch, the debut performance was finally held on the 8th of January 1895 in Barmen. It is a piece of early oratorical art that Bruch has created here, yet one that is cloaked in the era of the Late Romantic. The choir is the decisive mediator of events in the piece of work. In addition to delicate poetic expression, the dramatic impact also demands particularly creative agility and adaptation from the singers. Even Bruch's contemporaries were suspicious of the opus. In June 1895, Johannes Brahms wrote to Clara Schumann: "Bruch has now published a Moses... If only one could feel a hint of joy in the stuff! They are weaker and worse than his own early works in every respect. The only good sentiment is when one feels inclined, as I do, to thank the Lord that he spared us of the sin, the vice, or the bad habit of mere score-writing." Bruch, on the other hand, saw himself affirmed in his work and wrote to his publisher Franz Simrock in February of 1895: I want to tell you a secret: noble and ample effects on thousands are not to be attained by common means; something higher, which cannot be defined, is working from within the productive artiste... I could have not have written Moses' had not a strong and deep feeling of divinity been alive in my soul, and every deeply insightful artiste will have experienced that once in his life, so that through the medium of his art, he can proclaim to the people the best and innermost emotions of his soul... And in such, Moses proved to the world that I did not stand still  as that is the most potent danger in older age." The oratorio so powerful and atmospheric in its choruses and arias consists of two parts and presents four episodes from the life of the prophet Moses. Part one of the opus begins with a short, dramatic introduction. The scene At Sinai depicts Moses as the leader of the Israelites. He is called to the mountain by an angel to receive the Ten Commandments from Jehovah. During his absence, his brother Aaron is designated as keeper of the people. The Sanctus beginning with Psalm 90 of both solo parts of Moses and Aaron in alternation with the people was a core part of the opus for Bruch. In the second scene, The Golden Calf, the plot makes a wide bend, heading towards the oratorio's tragic conflict, the Israelites' digression from Jehovah. Three impulsively scored chorus scenes portray the chosen people's restlessness and doubt caused by the prophet's long absence. The crude demand made of Aaron to produce a golden calf as a visible idol culminates in the anger of Moses, who has returned and calls to order the Israelites who are dancing around the false god Baal. Part two (episode three), The Return of the Scouts from Canaan, begins in the middle of the conflict between Moses and the Israelites. The scouts Moses has sent to the Promised Land bring back hymnic reports of the "land of dreams", but the prophet deems the people of Israel unworthy of the Promised Land. Aaron and the Israelites arrive at deeper insight: "oh Lord, help us find mercy". A depiction of the fight with the Amalekites then follows. In the last episode, The Promised Land, the Lord's angel proclaims to Moses his approaching end. The prophet leads his people to the Nebo Mountain where a view of Canaan is granted. Moses blesses the Israelites here before he passes away.